No photos this week — L’Oiseau chewed on the plug that connects the camera to the computer and now they won’t talk to each other. Yeah, I know, I wonder about that kid, too. But anyways, on to The Breakfast Thing, my solution for a super-quick, satisfying and vegetable-packed meal. Plus, it’s easy to wrap up and eat in the car! 1. Lay a tortilla in a non-stick frying pan. After it warms for just a few minutes on medium heat, flip it. 2. Sprinkle on some shredded cheese and let it melt. 3. Slide the tortilla onto a plate. 4. Top with a big handful of salad mix and any other veggies, raw or leftover, that you desire. I frequently add sliced mushrooms, sliced bell peppers, cooked green beans and even chick peas. 5. Add a little salad dressing or, even better, a few spoons of this stuff. 6. Fold it in two like a taco and enjoy! I frequently think (usually when chomping a big bite) that this is a salad taco, rather than a taco salad. For a to-go order, just start with the tortilla on a piece of aluminum foil. Wrap it up and then just peel back the foil to eat as you go. The Breakfast Thing is the original gift to the world of the Sugar Shack, food vendors featured every year at the Lake Eden Arts Festival in western North Carolina. I don’t know if they are also a permanent restaurant, but if you are in North Carolina and know of a restaurant called the Sugar Shack, it would probably be worth checking out. They have changed my life with this wonderful food item. Oh, yeah, don’t be misled by the name—it’s great for any meal or even a snack. Simplest way I’ve found to get a healthy start on my busy mornings: smoothie cubes. I make green smoothie ice cubes whenever I have a surfeit of greens and super-ripe fruit. I keep them in the freezer, and on hectic work mornings, I blend a few cubes with some apple juice and a little water to make a super fast smoothie that involves no peeling, cutting, or composting, because that all took place on a weekend when I had time for those shenanigans. My favorite combination is kale, spinach, banana, and peaches. I sometimes add a little honey if the greens outnumber the fruit. I simply blend the greens and fruit with a little water to make a thick puree. Then I freeze the puree in ice cube trays. 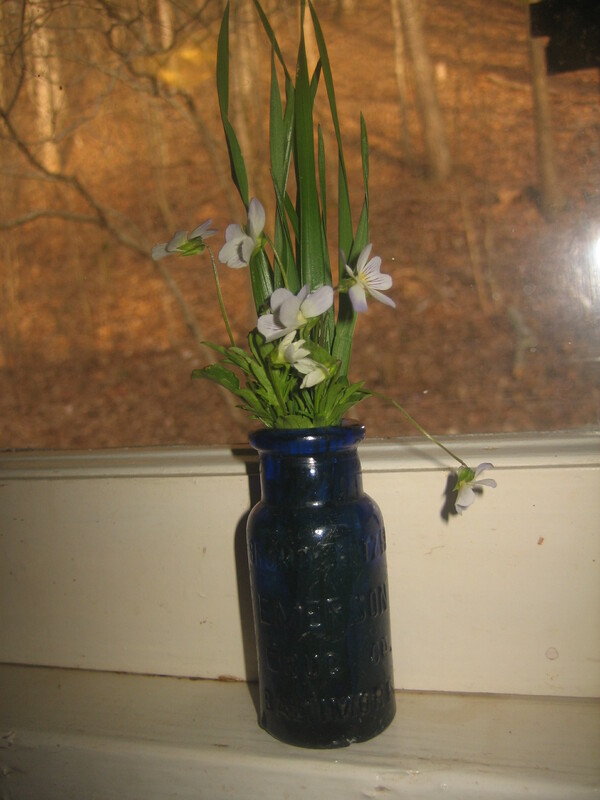 Pop them out and save them in a container in the freezer. An added benefit? 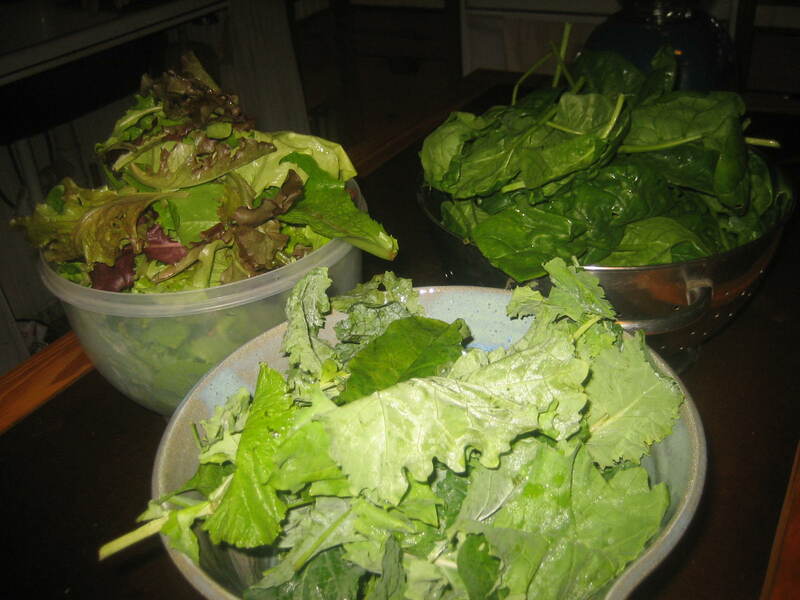 I can use up greens when they are exploding out of the garden, not to mention the ever-present overripe banana or two. [Vigorous shaking] Mother Earth and I are finally shaking off months of inactivity and springing back to life! Aaaaaaahhhhhhhh! Feels good!